Inuit Hunters Help Scientists Track Narwhals On a remote fjord in northwest Greenland, traditional Inuit hunting techniques are being used to stick tiny, high-tech satellite tracking devices onto narwhals — a kind of Arctic whale famous for its long, spiral unicorn horn. On a remote fjord in Greenland, one researcher spends her summers studying narwhals. 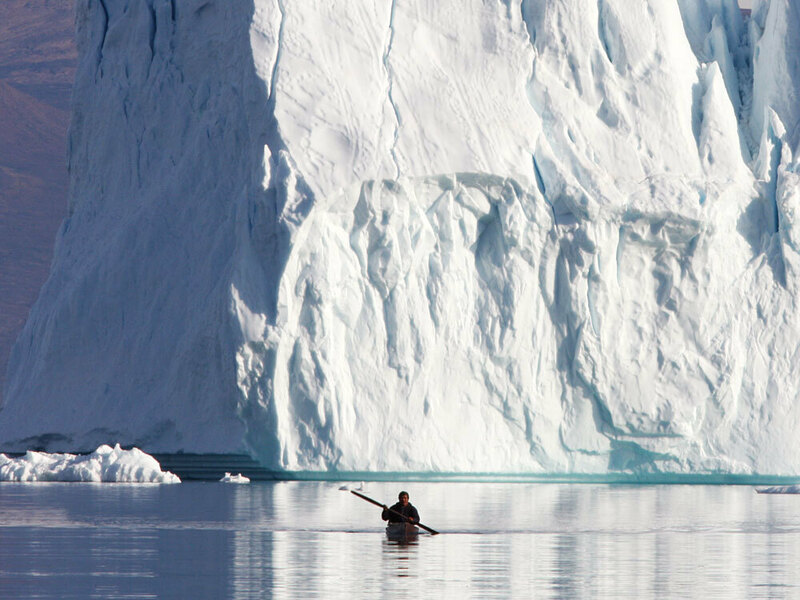 Isaq Qujaukitsoq paddles in his kayak near Qaanaaq, Greenland. 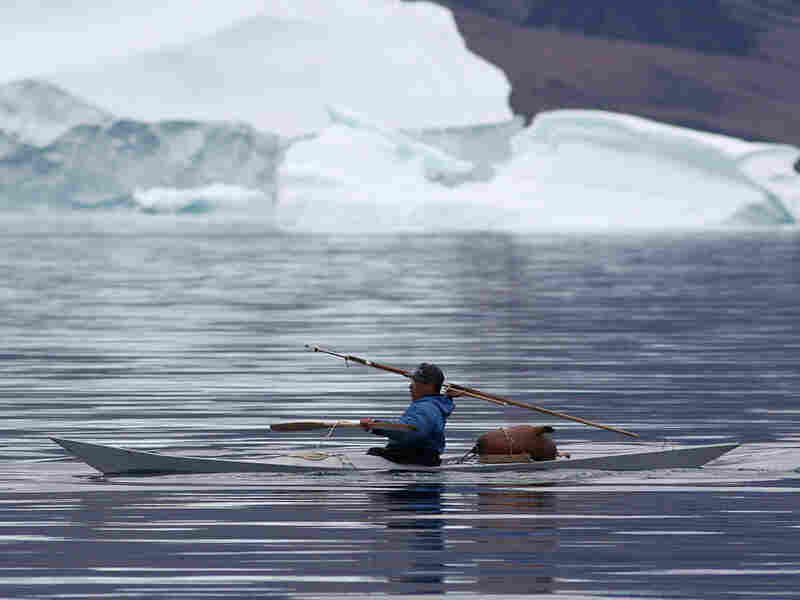 He and other hunters still use traditional Inuit equipment and techniques to sneak up on narwhals, and that's helping researchers study these elusive arctic whales. On a remote fjord in northwest Greenland, traditional Inuit hunting techniques are being used to affix tiny, high-tech satellite transmitters onto narwhals — a kind of Arctic whale famous for its long, spiral unicorn horn. The narwhals in this area are particularly tricky to capture, and researchers hope this technique can help them learn more about these elusive creatures. Kristin Laidre, an oceanographer at the University of Washington, travels every year from her home base in Seattle (where she leads what she calls a "fairly normal" life) to Qaanaaq, Greenland, one of the most northern communities in the world, around 850 miles from the North Pole. This small town has brightly colored little houses looking out over a fjord filled with icebergs. In the summer, there's endless sunshine and the sound of sled dogs barking. Qaanaaq is where Laidre meets up with her research collaborators: five local Inuit hunters. "I couldn't find five biologists, whether they had Ph.D.s or 20 years of field experience, and bring them up here and have them be as good as five guys from that town right there," says Laidre. "No way." 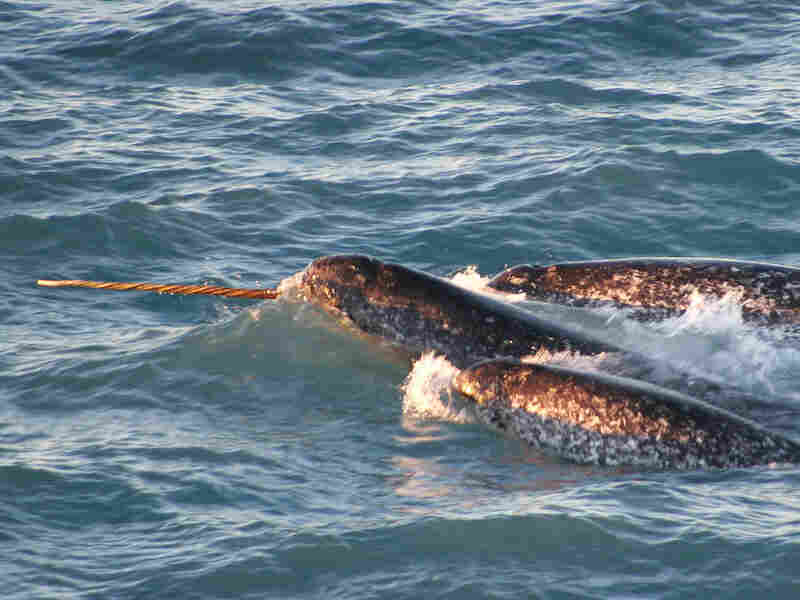 When the hunters throw their harpoons to tag narwhals, they have to hit a spot on the animal's back that will come up out of the water when it breathes, so the tag can communicate with a polar orbiting satellite. One of the hunters who works with Laidre, Mads Ole Kristiansen, says the effort to tag narwhals "is very important to us and our future. It's very, very important to narwhals and this area." Around here, hunting feeds both people and their sled dogs, especially in winter, when it's hard to bring supplies in from the outside. And Kristiansen says his community knows the importance of sustainable hunting. If the narwhals are not respected, he says, they will no longer return to Inglefield Bredning fjord, an important summering ground that's home to thousands of narwhals. 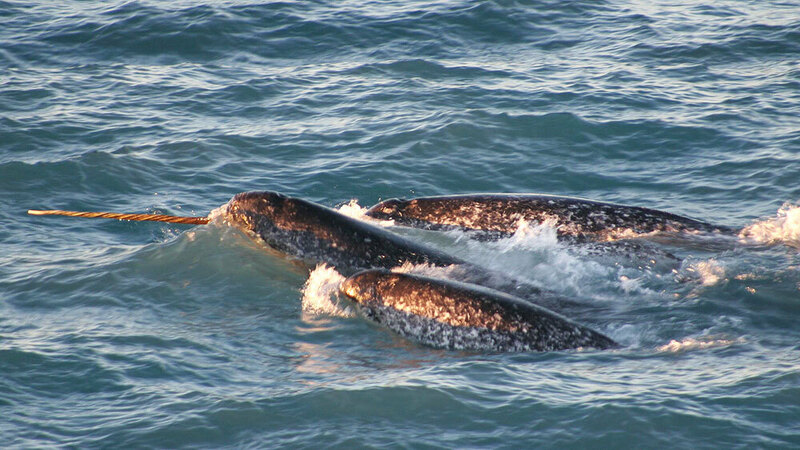 The Greenland Institute of Natural Resources supports research to try to use satellite tags to see where these narwhals go in the cold, dark months of winter, Laidre says. "It's possible that these whales travel south, along the coast of Greenland, and are hunted at other sites," she explains. Or, maybe they winter far from shore and people. If so, that would mean they're really only hunted one season a year. "And that has implications for how biological advice is made for, you know, what their quota should be and how intensively they should harvest the population," Laidre says. In Canada and other parts of Greenland, Laidre and other researchers have tagged narwhals by first catching them in nets. But in this fjord, the narwhals seem too clever for that — the nets haven't worked, at least not yet. The tip of the harpoon is a spear-like anchor, which can stay attached to a narwhal for a few weeks. 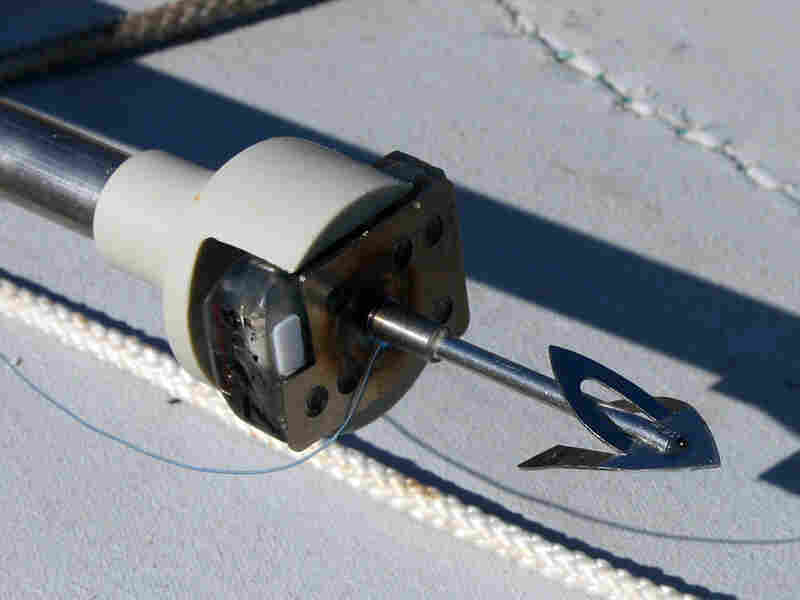 A small satellite tag about the size of a matchbox fits on the end of a harpoon. So a few years ago, she was sitting around with some colleagues and hunters, and they brainstormed another possible approach. The hunters around Qaanaaq still use traditional techniques to hunt narwhals, including handmade kayaks and wooden harpoons with detachable points. "These guys are, you know, experts at paddling out and getting close [to the] whales, and throwing a harpoon and hitting it," says Laidre. "So, I mean, if you're going to hit it with a harpoon, why not hit it with a transmitter?" The team modified a tiny satellite transmitter — the size of a matchbox — so it was like the detachable point of a harpoon. She says the first person to stick one onto a narwhal was a hunter named Kristian Eipe. "I remember it was pretty foggy, and there were whales out in front of the camp, and he threw his harpoon and set the tag right in the right spot, and we all screamed and clapped," says Laidre. Since then, Eipe and the other hunters have tagged more than a dozen narwhals. This year, two were tagged — one by Kristiansen, and the other by Thomas Qujaukitsoq. Kristiansen explains that when tagging a narwhal, unlike when hunting, the harpoon has to hit a very specific spot, a part of the whale's back that will emerge from the water when it comes up to breathe, so that the transmitter can communicate with the satellite. Hunter Mads Ole Kristiansen of Qaanaaq takes aim with his harpoon. 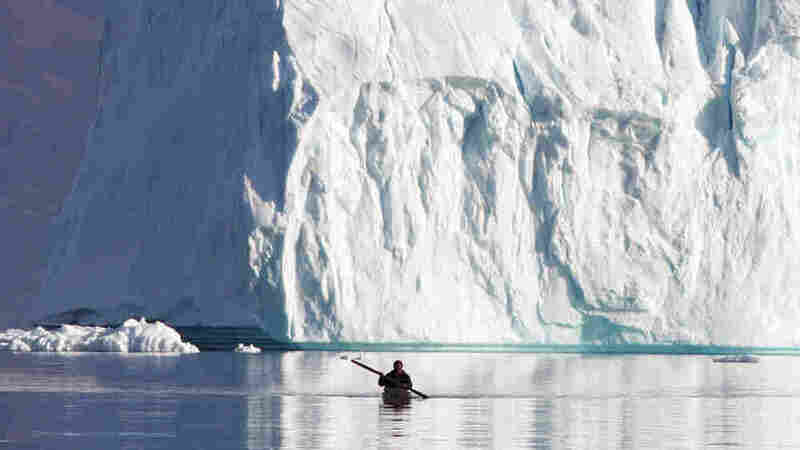 Behind him on his kayak is a kind of buoy made from the inflated skin of a seal. But even though the harpoon technique has allowed researchers to track this population of narwhals for the first time, the tiny transmitters only stay on a few weeks, not long enough to follow the narwhals into winter. The researchers want to modify the harpoon tags, to get them to last longer. In the meantime, though, they're also still trying to catch narwhals in nets, so they can get their hands on the whales and put on larger, more secure tags that last months. And the hunters generally manage the nets, too. The research team camps out on a rocky beach surrounded by glaciers coming down from the ice cap. It's an interesting jumble of different cultures, and everyone passes time together waiting for narwhals to appear. One hunter, Niels Mirunge, carves pieces of narwhal tusk into beautiful little sculptures. As he works, it sounds and smells like a dentist's office — because a narwhal's tusk is actually a large, spiral tooth. He can sell his art at a store in town, but Greenland's restrictions on the export of narwhal ivory make it impossible for tourists or anyone else to legally bring it out of the country. In the evenings, there are communal dinners filled with laughter and then movies on a laptop — everything from Back to the Future to an old documentary on Inuit life to a video that a tourist made of a dog sled trip with one of the hunters. One day, Laidre plays recordings she made of narwhals using an underwater hydrophone. The whales make a strange creaking that sounds like cracking ice. Are the narwhals out in the fjord listening to the racket being made by this whole group of humans on the beach? Laidre doubts it. But Kristiansen says that when he was just a boy following the older hunters, they'd tell him not to throw stones in the water or run on the beach — because the narwhals can hear. This year, for whatever reason, the narwhals once again seem wise to the nets. The only satellite tags that have been attached are the ones that get harpooned. And for Laidre, one thing is certain: "This project wouldn't exist without the hunters, and we wouldn't have had any success until this point, and we won't have any success if they're not part of it."